"Like his contemporaries Erasmus and Rabelais, Brueghel clearly understood the power of the ludic over its graver alternatives. And yet it is the coexistence of these two themes that he celebrates and immortalizes. 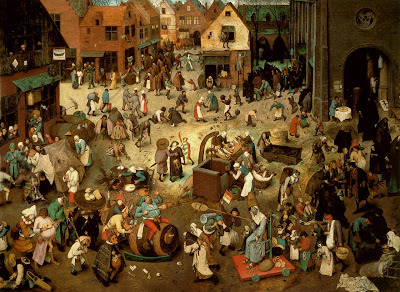 Carnival has no meaning without Lent; locked in an eternal contest, they enact the battle between passion and reason, appetite and intellect, pleasure and piety, excess and scarcity that encompasses so many of the questions that guided and shaped the lives of early modern Europeans."